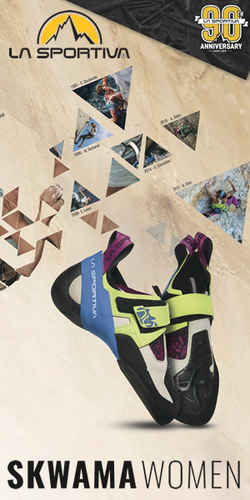 You’ve climbed plenty of sport and trad routes. Do you enjoy mixing it up, or do you prefer one over the other? I really enjoy mixing it up - i think it is good for motivation and allows you to challenge yourself in different ways. I have met lots of friends through both and think both disciplines lend themselves to forming good connections with people, which I like. I was introduced to climbing with trad climbing so I guess it will always be special to me for that, and I feel a greater sense of connection to places where I have had good (or bad!) trad experiences. What do you enjoy about the different aspects? For example, training and stress-free falling in sport climbing, and the ‘endurance/fight’ of trad onsighting? I guess primarily, in climbing, I love the movement (probably because of my dancing background) so I enjoy the cluster-free movement of sport climbing, where you can be absorbed in it without having to think about anything else. I really like unlocking sequences on sport projects. With trad I get a deep satisfaction from working everything out on the spot in onsighting, as well as keeping calm on headpoints and trusting my ability. Do you think Pembroke is possibly the best trad crag in the world? Pembroke definitely has a special place in my heart and I think it is one of the best trad crags in the UK. Climbing above the sea is such a great feeling! But there are a lot of good trad crags in the world, so I'm not sure i can give the prize to Pembroke alone! Congratulations on recently climbing Mind Control (8c at Oliana, Spain). How was it, and how did it compare to Bat Route (8c, Malham)? Mind Control is up there quality-wise with Bat Route. For me it was probably easier than Bat Route, because Bat Route has some hard moves on it, whereas Mind Control is more stamina - which suits me. I spent some time training to get stronger for Bat Route, whereas I could just keeping trying Mind Control and build fitness on the route. Having said that they both took pretty much the same number of sessions to do! Mind Control required a bit more calm seen as the crux is near the top, and with the sun and heat there was only really time for one redpoint a day. You said in an interview with UKC after Mind Control that you ‘experimented with some mental techniques’. Can you give some examples, and how they helped? I incorporated meditation and some mindful movement into a morning routine. The techniques from the meditation, such as focusing on the breath, sensations or sounds were useful on the route for keeping me focused and in the present (pretty easy to get distracted on a 50m route!!!). With the mindful movement stuff (yoga, exercise ball work or physio), I worked on moving with my breath to pace me and really trying to pay attention to tension in my body, which helped reduce judgement in any one movement - I did this on the route to and I think this is really helpful for climbing efficiently. Moving efficiently is all about being focused, present and body aware. I hope your shoulder recovers fully. Do you think being injury-free is under-estimated in climbing, and is a really important part? Any advice on how to avoid injuries (e.g. lots of rest/sleep, healthy diet, stretching). I'm not sure being injury-free is under-estimated in climbing, but perhaps the emphasis on how to stay injury free isn't broad enough. I think with my main downfalls have been thinking that a little bit of thera-banding before climbing is going to keep injury at bay - I expect my shoulder to take a lot more weight than that so need to train it. The best my shoulder has felt was after a weight based gym routine I did and we are seeing this more and more in climbing. The main thing for me is altering my attitude towards climbing and my body. The body is not a machine - I can get a bit over excited and keep trying to push myself when I'm tired. It's that whole "listen to your body" motto, but this is hard when your mind is "loud". I saw a physio, Pablo, in Siurana who helped with this - he said the main goal is a healthy body, then performance follows naturally. Would you like to go back to El Cap at some point? Since you’ve climbed Free Rider, what do you think of Alex Honnold soloing it? Does the boulder problem crux feel that secure?! I hope to keep returning to El Cap for many years to come. The relationship with El Cap is definitely more of a marriage, than a fling. I really enjoyed watching Free Solo having done the route. It's definitely insecure - the footholds are slippy, but actually the lower slabs on Free Blast are probably the most insecure pitches even though they aren't the hardest. So impressive! Have you got plans to transfer the sport fitness to UK routes (if the weather allows!) for this year? I will definitely be getting out trad climbing over the summer, but I am going to focus on getting my shoulder strong before hopefully returning to Yosemite in the autumn.